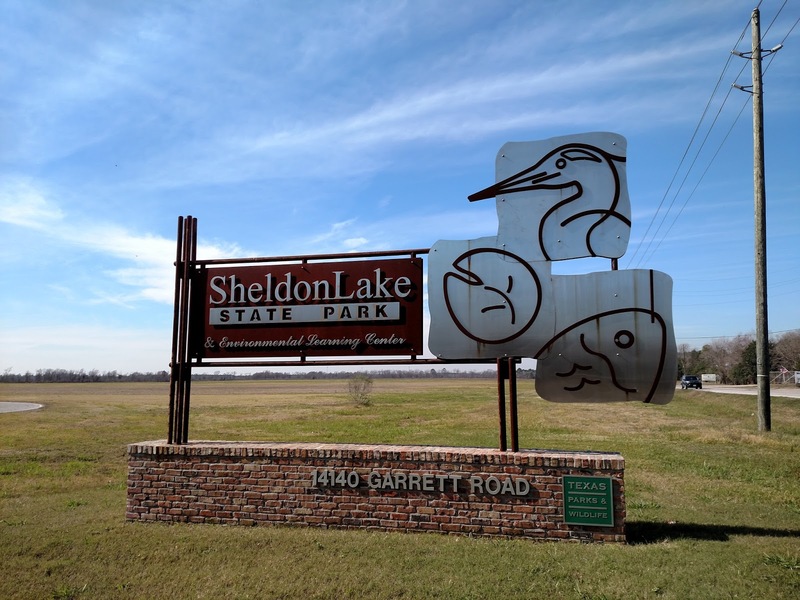 Every Tuesday a team of dedicated volunteers gather to restore the coastal prairies at Sheldon Lake State Park, northeast Houston, Texas. 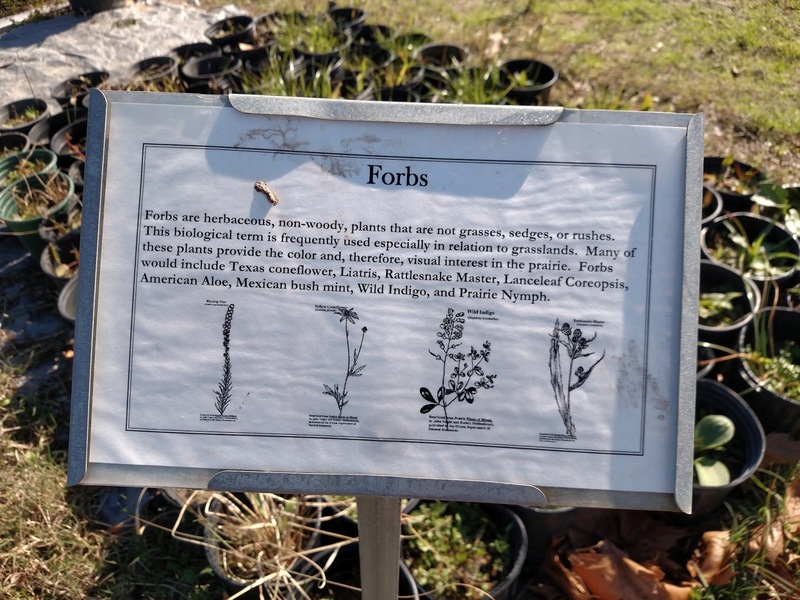 This week (1/12/2016) I joined them in their efforts to reestablish native grasses and forbs. 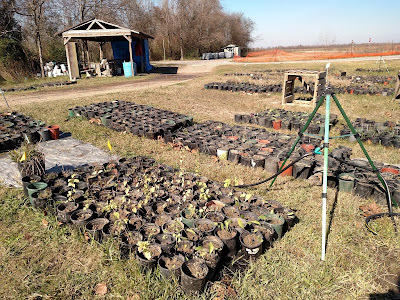 The day's tally for the seven of us: 281 seedlings potted and 220 mature plants transplanted into roughly a half acre of young coastal prairie. The numbers add up. In 2014, they planted 12,144 grasses and forbs across 16 acres. Potted seedlings grow for 6 months before transplant into prairie. Two hundred years ago these ecosystems covered 9 million acres—prior to cows, plows and housing developments. Today less than 0.1% remains. Looking at the larger picture, restoration may seem a hopeless task. But looking differently at the same picture, it's still proud and fulfilling work: planting those young grasses into the same swampy soil their ancestors grew in for ten thousands years, and where their descendants will hopefully grow for another ten thousand. Harvesting iris for transplant into restored wetlands. 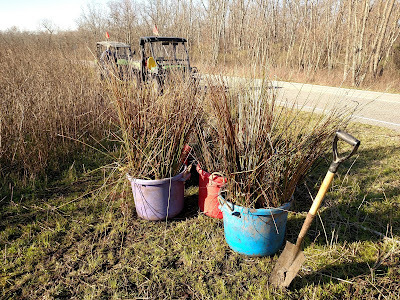 Aside from the fulfillment, the fun work and the new friends, volunteering at Sheldon Lake is also a great opportunity to learn about this part of our natural heritage: the coastal prairies—their historic problems and restorative solutions. 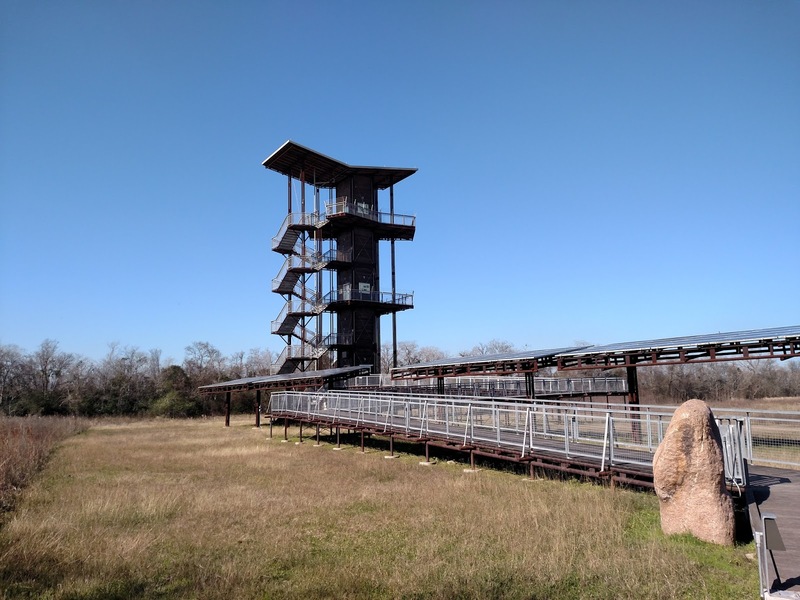 For more history of coastal prairies and why they're important, visit Armand Bayou Nature Center. 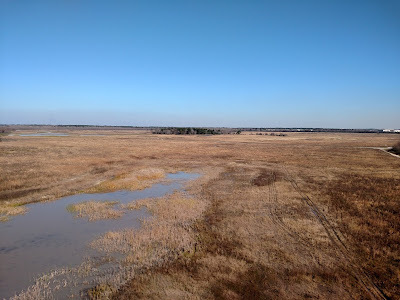 Prairie/wetland view from observation tower. 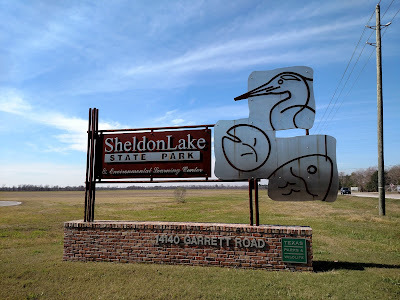 The modern history of sheldon Lake SP is a history of human interference. In 1943 engineers constructed levees around the entire site and flooded it, creating a reservoir and backup water supply for wartime industry. After the war it was drained (except the current Sheldon Lake) and converted to agricultural use. 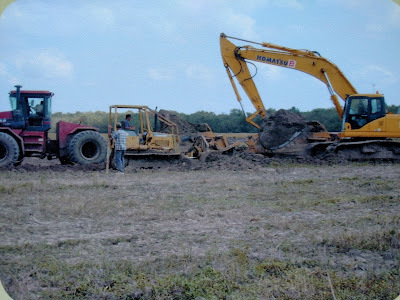 The terrain was leveled and cultivated for corn, rice and sorghum up until 2003, when restoration began. The suppression of fire (which ecosystems are dependent on) and the introduction of invasive species further degrade these ecosystems. Sprouts of invasive Chinese Tallow. A restored ecosystem first needs a foundation. 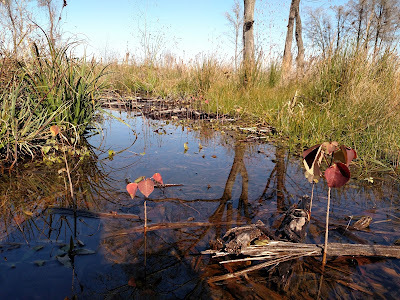 For coastal prairies that means uneven terrain, a patchwork of low wetlands and raised dry-ground, or mima mounds. A diverse microtopography means more diverse plant and wildlife habitat, like we've seen with cranberry bog restoration in New Jersey. To restore these features at Sheldon Lake, aerial photographs from 1930 helped pinpoint their original locations, and bulldozers guided by GPS reshaped them. 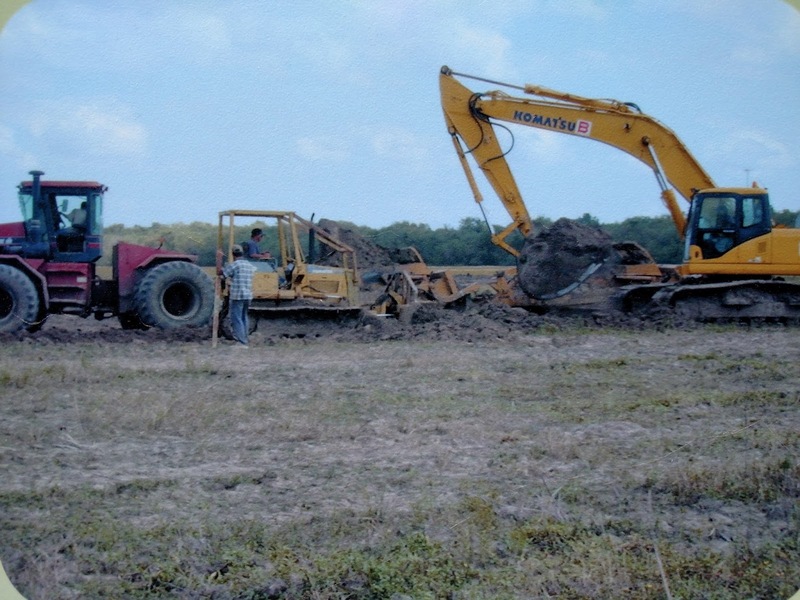 (This terrain restoration method was in fact pioneered here at Sheldon Lake, led by TPWD's Natural Resources Coordinator, Andrew Sipocz.) 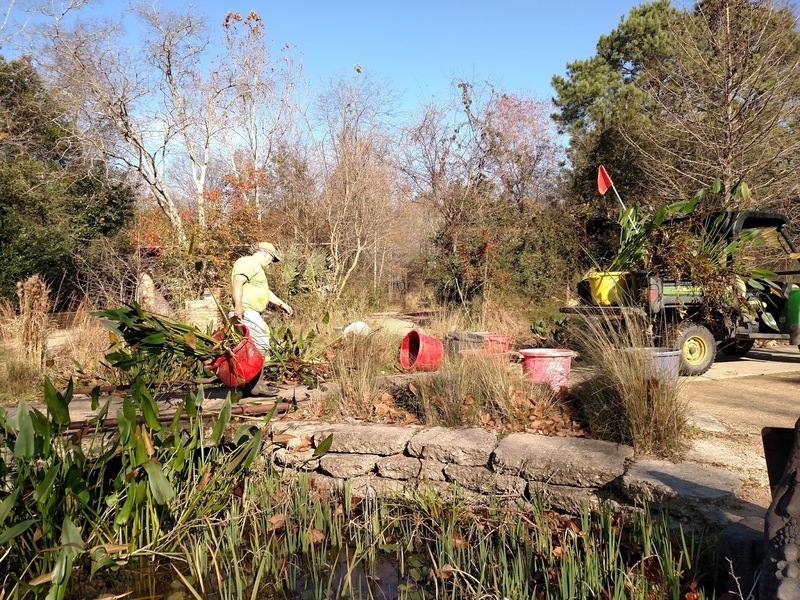 With the groundwork in place, the native flora could now be restored. 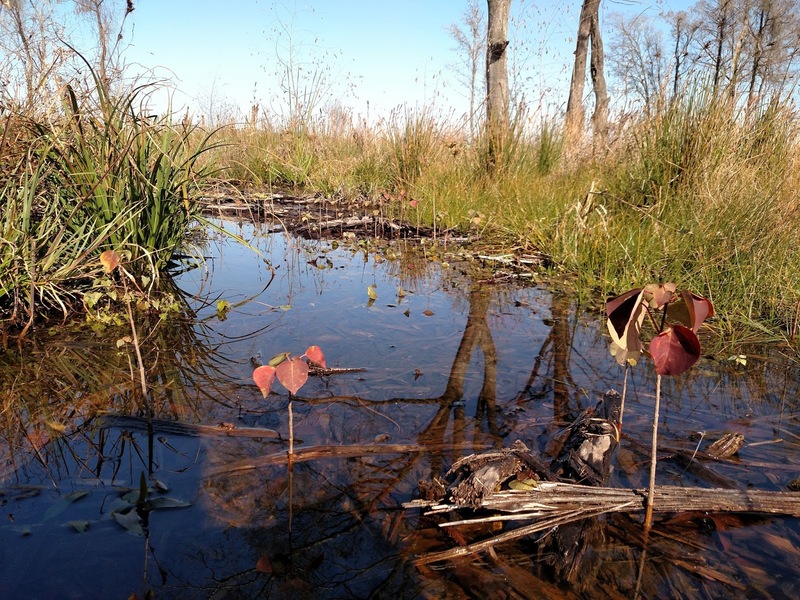 Reshaping wetlands. Photo credit: interpretive sign on nature trail. Unfamiliar to native herbivores or insects, exotic plant species can proliferate unchecked, smothering habitat and biodiversity. Their removal is the highest priority, and the greatest challenge. 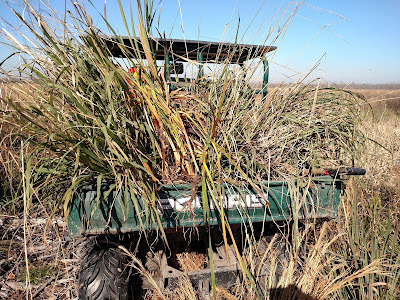 Borrowing methods proven successful at Armand Bayou, a Seppi machine churns the dense thickets of Chinese Tallow into mulch (known as mastication). Stumps must then be sprayed with herbicide to prevent resprouting, and seedlings must be pulled. 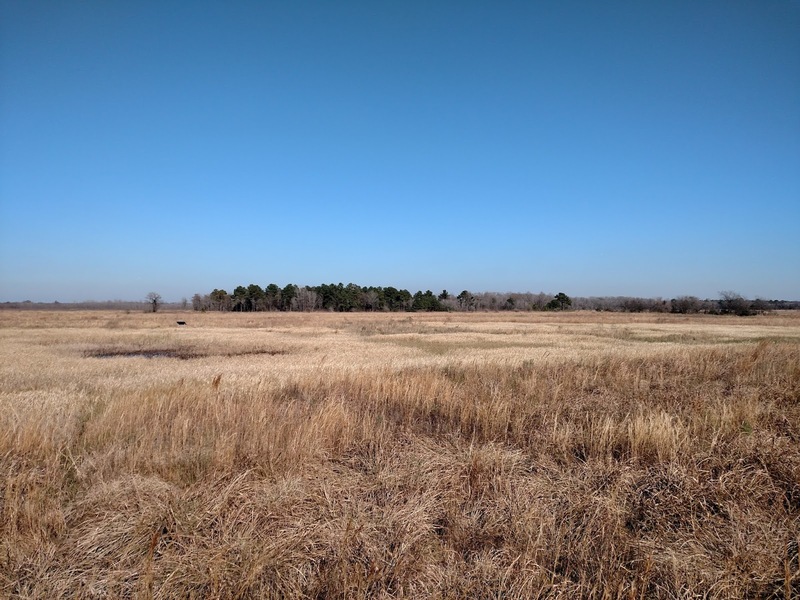 It's a struggle that can last a decade, until native prairie species can hold their own. 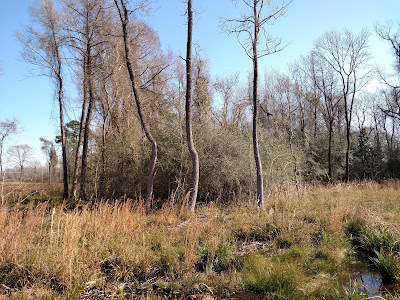 Chinese Tallow thicket on the prairie's edge. Foreground has been masticated. Removing invasive grasses and cattails. With a blank slate, planting native prairie grasses and forbs (flowering herbs) becomes the focus. 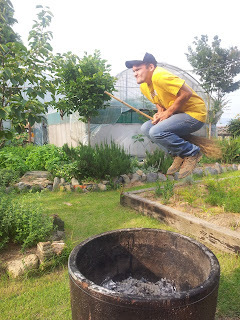 The plant inventory consists of three general categories. 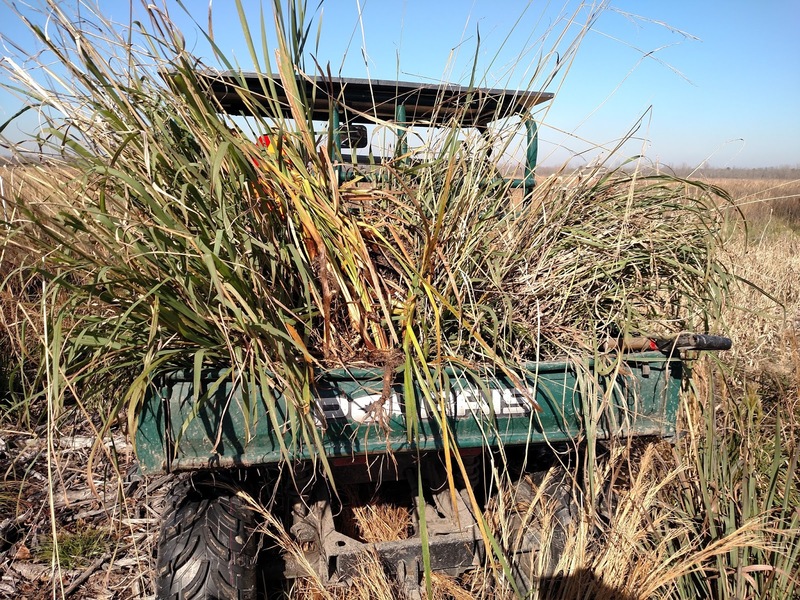 Grasses – The bread and butter of the prairie ecosystem, these are the “Big Five” tallgrass species: big bluestem, little bluestem, switchgrass, indiangrass and gammagrass. 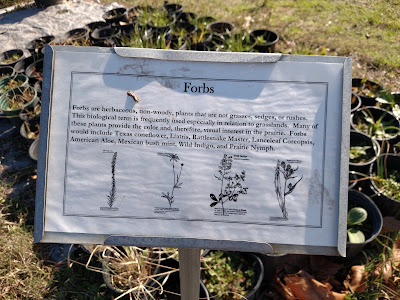 Forbs – The flowering and herbaceous plants, these provide the color and nectar of a prairie, including bush mint, coneflower, coreopsis, liatris, prairie nymph and wild indigo. 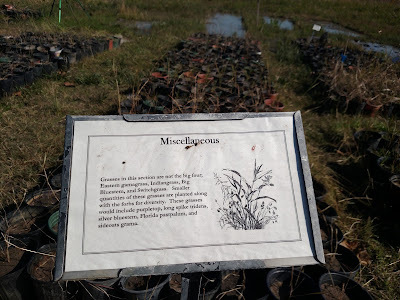 Miscellaneous – These are any additional native species that need planting, like the 20 or so other grasses not part of the “Big Five,” including bushy bluestem, Louisiana rye, purpletop, beaked panicum, brown and Florida pastpallum, sugarcane plume and gulf muley. 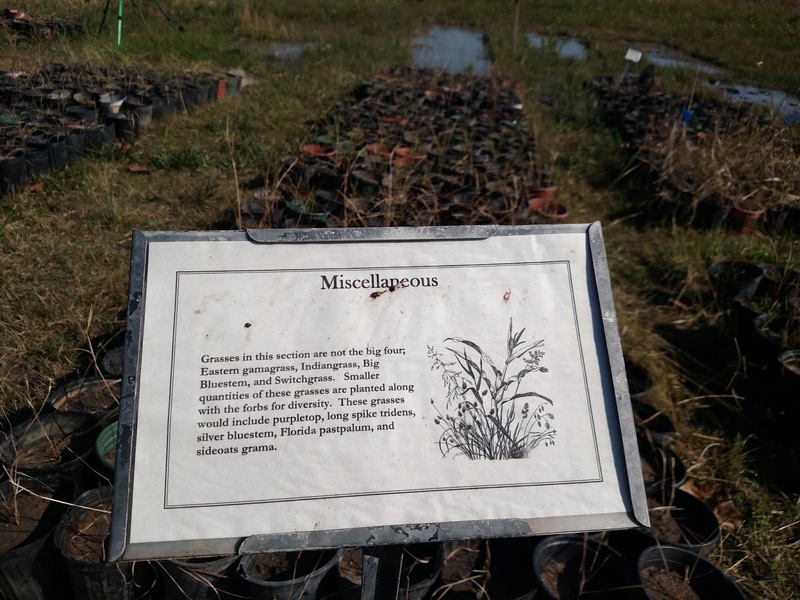 This categorization helps strategize and monitor planting efforts, with a ratio adapted to the needs of each site. Initially at Sheldon lake the focus was on establishing grasses, with a 70/15/15 ratio. In recent years the needs have evened to a 30/30/30 ratio. At Armand Bayou it's 5/90/5, with a high priority on forbs for the sake of aesthetics and attracting donors to the non-profit. 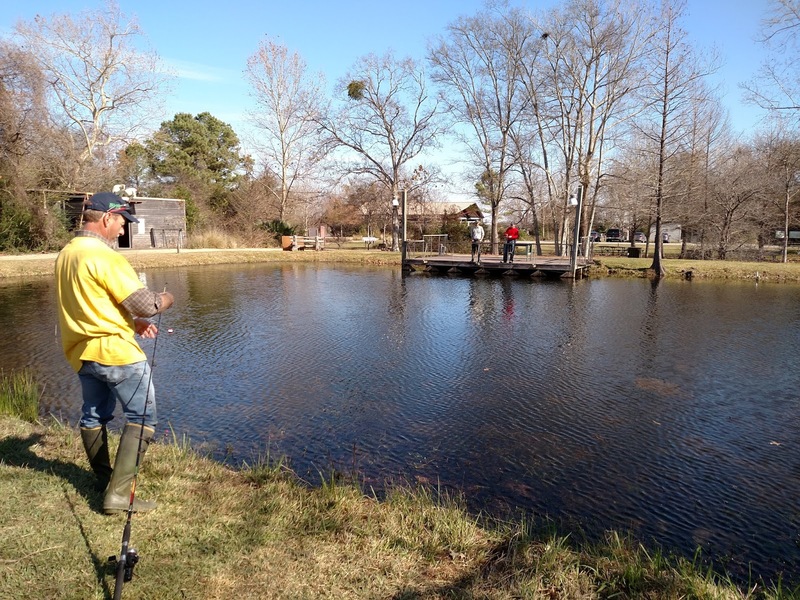 There's much work to be done at Sheldon Lake State Park, and volunteers are in high demand. They grow seedlings faster than their small team of regulars can plant, according to Tom Solomon, the de facto head of nursery operations. So join the volunteers at Sheldon Lake on Tuesday (prairie) and Wednesday (wetlands), at San Jacinto Battleground on Thursday, and at Armand Bayou Nature Center on Friday. Rescuing and multiplying juncus on Wetlands Wednesday. Two trout-stocked fishing ponds, with poles available to borrow. An observation tower, with views of prairies, Sheldon Lake and Houston.